Q: Who is the Minnesota Ballpark Authority? Q: What is the cost breakdown for Target Field? Q: What does Target Field look like? Q: What is LEED Certification? Q: What accessibility features are available for persons with disabilities? Q: Where is Target Field? Q: How do I get to and from Target Field? A: The Minnesota Ballpark Authority is a public body that was created by the 2006 Legislature to oversee the design, construction and operation of Target Field. The MBA owns the site and the facility on behalf of the public. The MBA is committed to protecting the public’s investment, while creating a new urban landmark that ties into new rail lines and potential new development. The MBA consists of five Commissioners appointed by the Governor (2), Hennepin County (2, including the Board Chair) and the City of Minneapolis (1). A: The total ballpark budget stands at $435,500,000 million with the public infrastructure budget at $119,525,000. Under the terms of the original legislation, the public contribution totaled $350 million, which included $90 million for infrastructure and $260 million for ballpark construction. The Twins contribution totaled $130 million for ballpark construction costs and any cost overruns. Since the legislation was adopted, the team has contributed an additional $65 million ($15 million for non-land infrastructure expenses, $4.5 million for plaza enhancements and $45.5 million for ballpark enhancements). In addition, public sources such as the Minnesota Department of Transportation, the Northstar Project and the Minnesota Ballpark Authority have contributed an incremental $5.525 million to the public infrastructure budget. The Minnesota Ballpark Authority’s additional $2 million comes from the interest earnings on construction bonds; $1 million went towards LEED Certification and $1 million for District Enhancements and Public Art. Click here to view a breakdown of the project budget. A: There are six separate levels in Target Field totaling approximately one million square feet. The Champion’s Club features extra-wide seats and access to the Champion’s Club Lounge that features a sit-down experience, upscale concessions and other great amenities. The ballpark has one of the closest seating bowls to the playing field in all of Major League Baseball with a 360 degree view of the playing field. The Legend’s Club includes padded seats along with access to private, climate controlled lounge areas featuring full-service bars, large screen TVs, fireplaces and upscale food options. Fifty-four suites are located above the Club Level and afford spectacular views of the action, comfortable furnishings and upscale catering. The ballpark features approximately 20,000 fewer upper deck seats than the Metrodome. There are heated concessions, restrooms, restaurants and lounge areas on each ballpark level. A: The U.S. Green Building Council has awarded Target Field LEED Silver Certification, making it the second Major League ballpark in the United States to achieve that status. Having collected the most certification points ever awarded to a ballpark, Target Field is the greenest ballpark in America. LEED stands for Leadership in Energy and Environmental Design. LEED Certification is a rating system that the U.S. Green Building Council developed in 1998 to promote design and construction practices that increase profitability while reducing the negative environmental impacts of buildings and improving occupant health and well being. 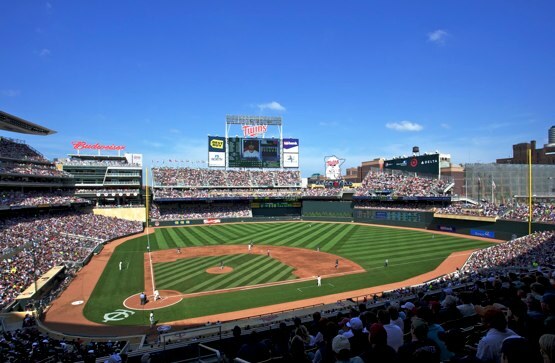 The Minnesota Ballpark Authority (MBA) and the Minnesota Twins spent approximately $2.5 million to obtain LEED certification for the new ballpark. The MBA contributed up to $1 million from its interest earnings on construction bonds and the Twins invested an additional $1.5 million. The money was spent on such things as environmentally friendly carpets, paints, heating and ventilation systems. The funds went toward adding more bike racks and implementing sustainable design features to reduce energy and water usage and documenting the LEED certification process. Less than 2 years after receiving LEED Certification Silver for New Construction, Target Field also attained LEED Silver Certification for the operation and maintenance of the facility making the Minnesota Twins and Target Field the first professional sports franchise to attain this status. LEED Certification for Existing Buildings: Operations and Maintenance, helps building owners measure operations, improvements and maintenance on a consistent scale, with the goal of maximizing operational efficiency while minimizing environmental impacts. A: National disability advocates say Target Field is one of the most accessible sports facilities in America. With guidance from the Target Field Accessibility Advisory Committee–a group of architects, city planners, state building regulators, Twins officials and those in the disabled community–the Twins’ new home exceeds nearly every state and federal building regulation for persons with disabilities. Target Field features access for persons with disabilities to every available entrance. At the North Star Transit entrance, there are dual elevators in case one breaks down. Designers are also especially proud of a gradually sloping walkway that connects the elevated Sixth Street entrance with First Avenue North. There are also extensive drop-off areas for Metro Mobility vehicles at the entrance by home plate. The City of Minneapolis has also installed curb ramps that are wider than required. Once inside the ballpark, those with disabilities will find wider corridors, single-use or family restrooms designed to provide privacy for individuals and family members assisting them, and lower counters (34 inches) with brail and large print at all food and beverage concessions. Pay phones will feature TTY technology. Target Field staff is also specially trained to help those with disabilities safely exit the building in case of an emergency. New sight lines guarantee fans in wheelchairs won’t miss any action when others are standing during a big play, as is the case in the Metrodome. Those who are hard of hearing or deaf can read real-time PA announcements on outfield captioning boards. Headsets programmed to the PA system are also available. Special attention has also been paid to making tickets easier to purchase. Devices connected to the microphones at select ticket windows allow agents to transmit directly into hearing aids, a feature disability advocates hope becomes a national building standard. Speaker boxes at all ticket windows are set below the agent’s mouth so those who are deaf or hard of hearing can read lips. Automated ticketing machines are wheelchair accessible with brail. A: Target Field is located in Minneapolis’ historic warehouse district near the Target Center. Specifically, Target Field is on Third Avenue between Fifth and Seventh Streets. Click for a Map. A: This venue is one of the most fan friendly and accessible ballparks in the country – you can walk, bike, take a bus, train, ride a light rail line or drive your car to get to this vibrant downtown destination. Target Field is at the convergence point of the Hiawatha Light Rail Transit Line, the Northstar Commuter Rail Line, the future Central Corridor Transit Line, Interstates 394 and 94 as well as the Cedar Lake Bike Trail. Visit destinationtargetfield.com to plan your trip to the ballpark.